Wondering how long to boil corn on the cob? 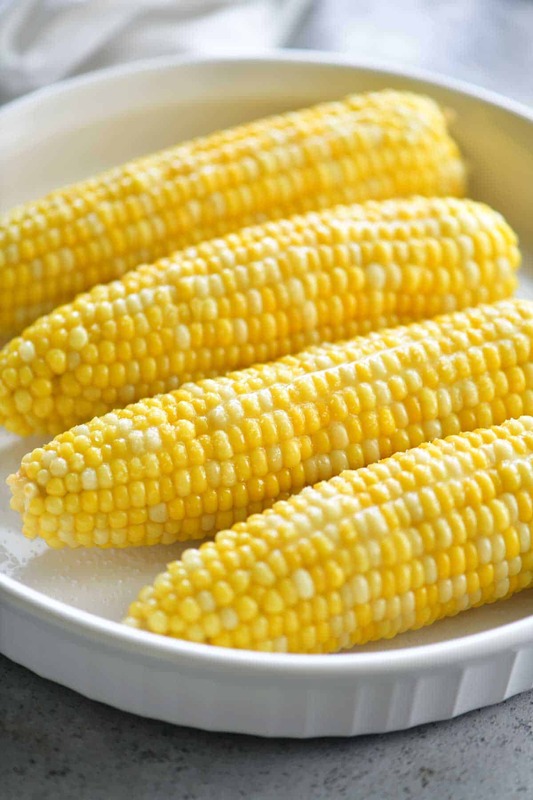 We’ve got you covered with this classic boiled corn on the cob recipe. Serve hot with lots of butter and salt. After trying so many various ways of cooking corn on the cob, I came to the conclusion that my favorite way is boiled corn on the cob. It’s not the easiest way to make sweet corn but I like the flavor and texture. Maybe it’s because that is how my mom always made it so it is what is most familiar to me. I can’t even remember how many times I’ve called my mom over the years to ask her low long to boil corn on the cob. Finally, I’ve got it here in a blog post so I won’t have to keep asking her! Before talking about how long to boil corn on the cob, I want to talk about how to choose corn on the cob. 1. The best corn on the cob is the freshest corn on the cob. Try to purchase from farm stands or farmers markets when possible since it was most likely picked recently. 2. 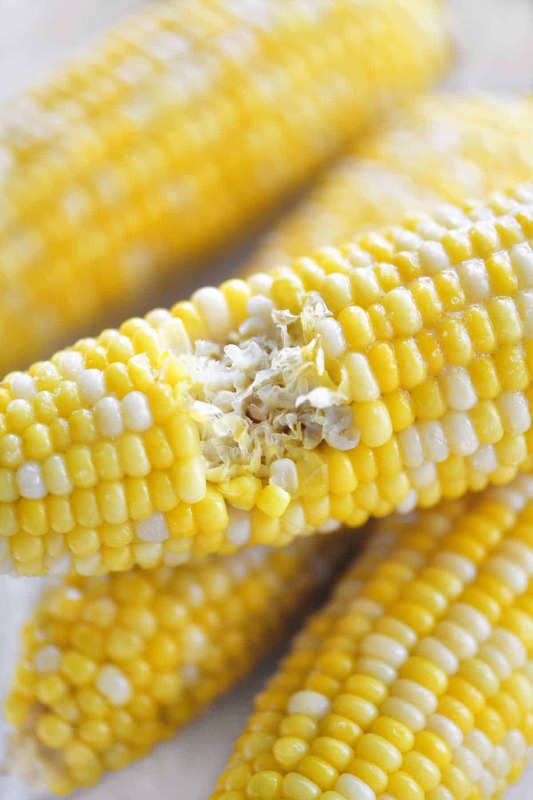 Go for the corn with bright green husks that are tightly wrapped around the cob. 3. Choose the ones with stems that are still moist. 4. 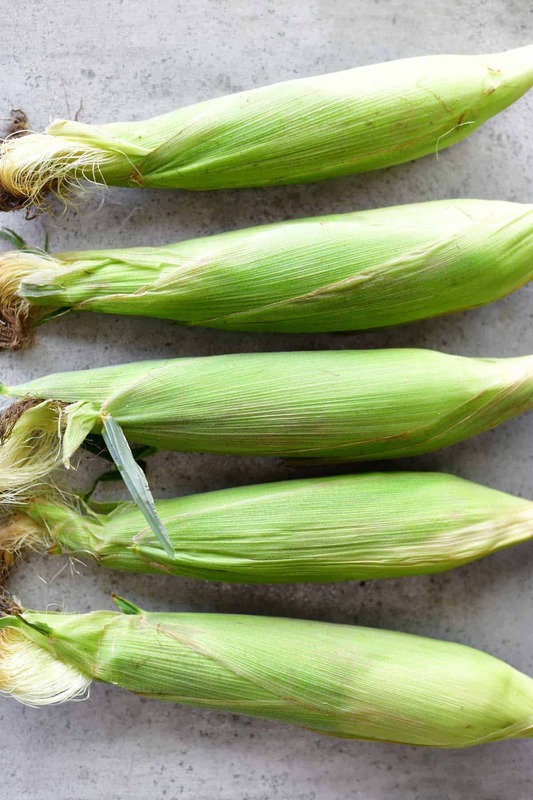 The corn tassels should be silky, sticky and moist. 5. Check for wormholes, worms, and bugs. 6. If possible, peel back the tops of the husks to check the tip of the corn cob. 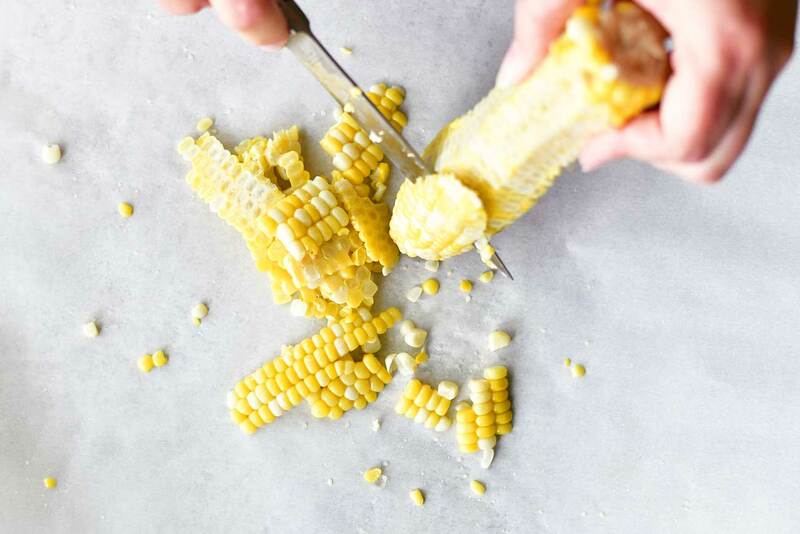 If you hate peeling corn on the cob, trying grilling it with the husks instead. Fill a large stock pot or dutch oven about half full with water. Add the peeled corn on the cob. Remove the corn on the cob from the hot water and place on a platter. Peel an inch or two of the paper off of one end of a cold stick of butter. 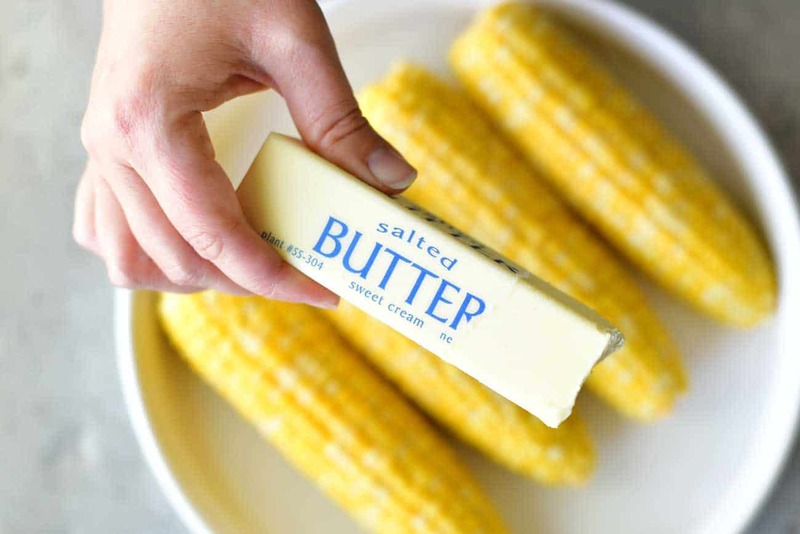 Hold onto the paper covered end of the stick of butter and use it to easily butter the corn on the cob. And don’t forget to sprinkle it with salt. The one thing I forget and have to figure out each corn season is how long to boil corn on the cob. The most important thing is that you don’t overcook it because then it gets mushy. The fresher the corn on the cob, the less time it takes to cook. 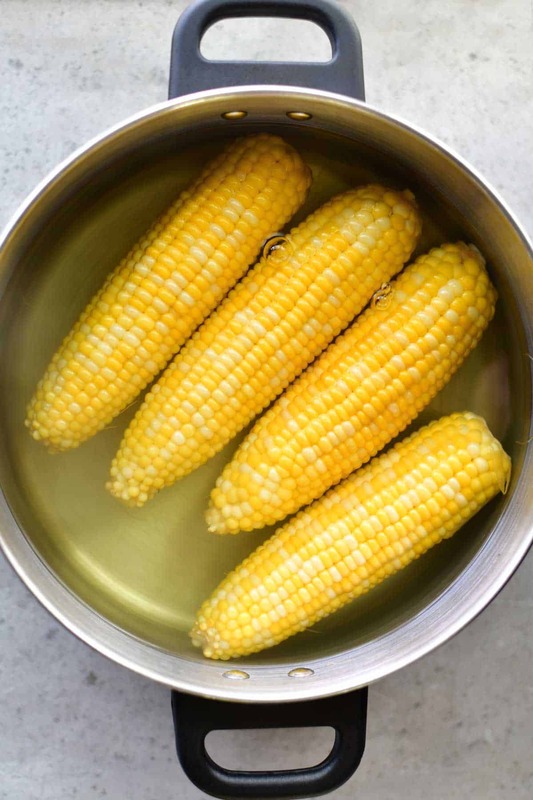 Once you return the water to a boil, it takes about 5-7 minutes for the corn on the cob to get hot and tender. 1. 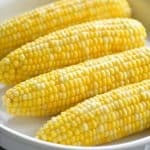 Should you add salt to the water when boiling corn on the cob? No, do not add salt to the water. The salt can toughen the corn. If you really want to add something, one of my best friend’s dads adds sugar to the water to sweeten the corn a bit more. 2. How do you know when boiled corn on the cob is done? When the corn on the cob is fully cooked the yellow color of the corn is more intense. 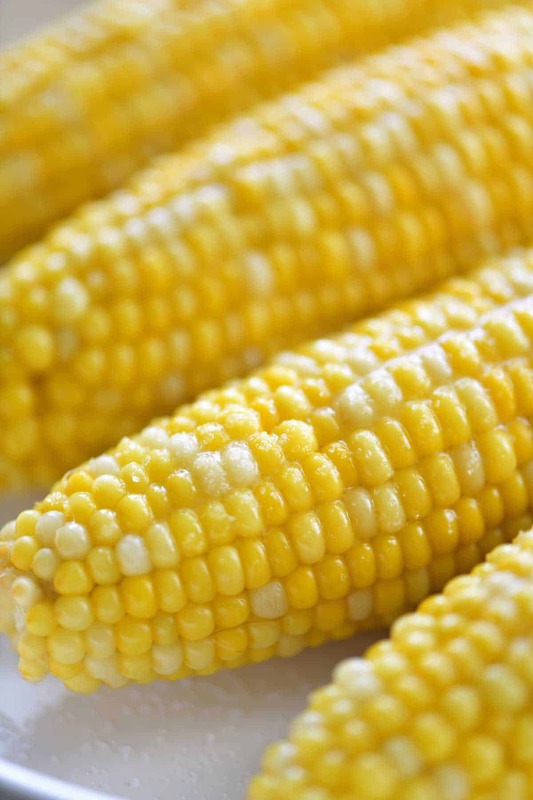 The kernels are plumper and more tender. You can test it by pricking a kernel with the tip of a sharp knife. But most importantly, the corn needs to be hot. You can use tongs to grab an ear of corn out of the water to check if it is hot. 3. How can I make boiled corn on the cob for a crowd? When making corn on the cob for large family gatherings, we bring more than one pot of water to a boil and cook the corn in batches. Keep the water boiling so that the next batch of corn on the cob can be added immediately. 4. How can I keep corn on the cob warm after cooking? 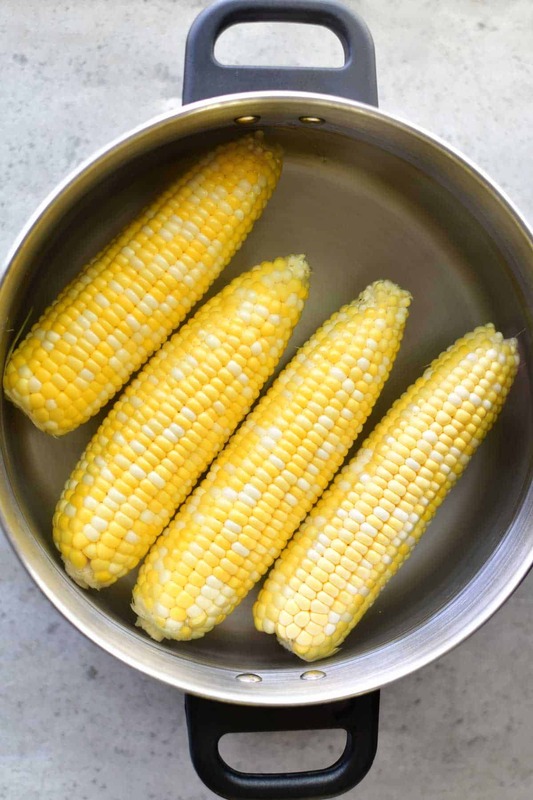 When making multiple batches of corn on the cob, place the hot, cooked corn on the cob in a large roasting pan and cover with foil. Place the pan in the oven that has been preheated to 180˚F. Corn Salad: This Corn Salad recipe is a creamy combination of fresh sweet corn, colorful peppers, and ripe tomatoes! It is the perfect summer salad for potlucks, picnics, and barbecues. Grilled Cowboy Caviar: This Grilled Cowboy Caviar recipe is a flavorful, healthy appetizer that can also be served as a salad side dish. Grilled veggies are a fabulous addition! Slow Cooker Corn Chowder: Easy slow cooker corn chowder with ham and potatoes is the perfect comfort food for a family dinner. Tater Tot Chicken Pot Pie: Try making Tater Tot Chicken Pot Pie because admit it…pie crust is boring. The whole family will love this spin on the traditional chicken pot pie recipe. Wondering how long to boil corn on the cob? 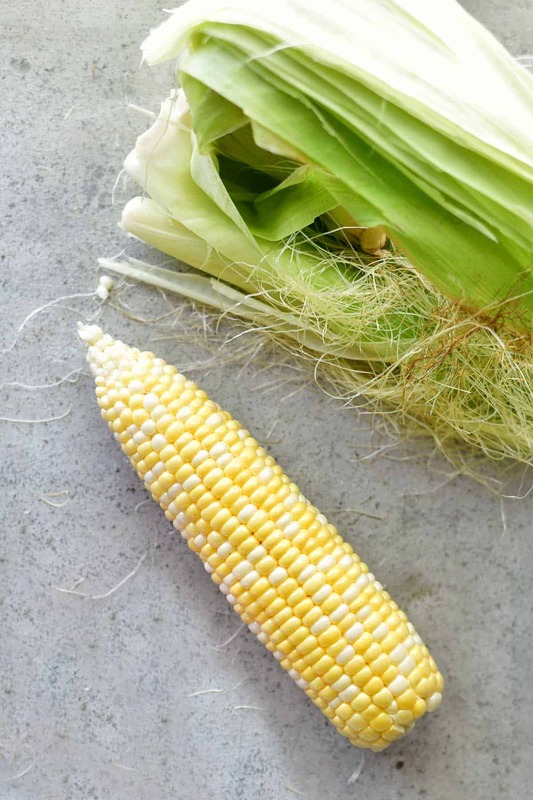 We've got you covered with this classic boiled corn on the cob recipe. Fill a large stock pot or dutch oven about half full with water. Bring the water to a boil over medium heat. Add the peeled corn on the cob. Cover and return to a boil. Cook for 5-7 minutes. Remove the corn on the cob from the hot water and place on a platter. Serve while hot with butter and salt. Baked Beans from Lil’ Luna: It’s such a simple recipe and is done in the crock pot!! It’s a must-have for summer BBQs. Instant Pot Potato Salad from Eazy Peazy Mealz: A delicious potato salad recipe where the potatoes and eggs are cooked together in an instant pot for a quick, easy, delicious potato salad. Broccoli Salad from Mom On Timeout: Packed full of broccoli, bacon, grapes, almonds and more – every bite is delicious! The perfect addition to any BBQ, party, or potluck! Pineapple Salad from The Gunny Sack: This pineapple salsa recipe has a delicious combination of sweet and spicy. It can be served with grilled chicken or fish or as an appetizer with chips. 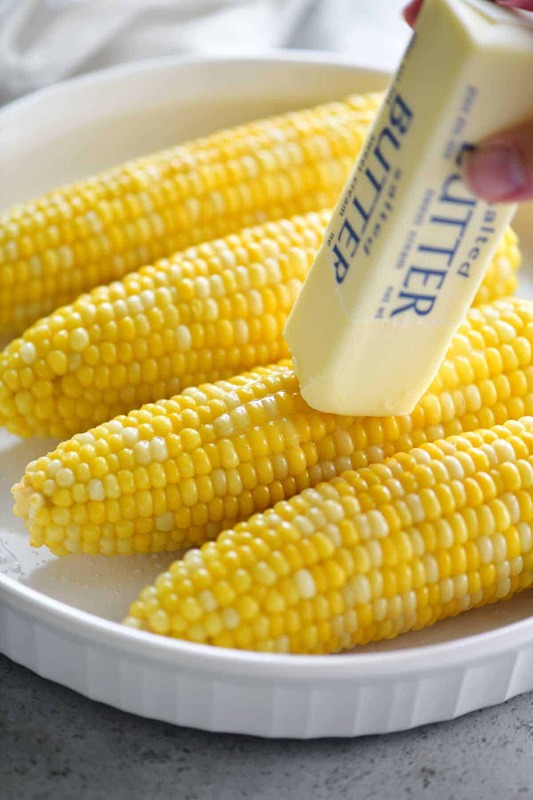 Roll your corn on a stick of butter. Not much to add ,cooking corn is basic. But when it comes to buttering the corn ,I learned my method that I saw in a movie 1979 (Breaking Away). Butter a piece of bread and just hold and roll your ear of corn in the bread. Do a couple of ears and toss the bread. Tonia, that recipe looks so yummy! I’ll have to try that one. Thanks for sharing. 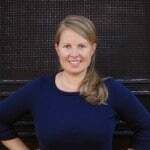 Tonia, thank you! I just made this recipe tonight and everyone loved it! Very easy and delicious! Thank you! I learned to fix corn on the cob from a good friend years ago. 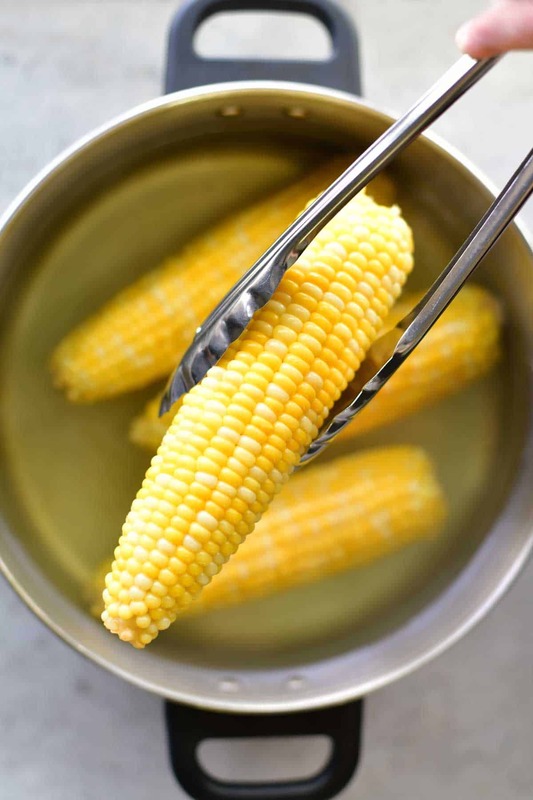 Shuck corn, clean off silks, lay flat in large kettle, add cold water, just to cover the corn. Cover and put on high heat. When water comes to boil, the corn is done. Pour water off and put lid back on. Corn will stay hot for quite a while. You can do any amount of corn this way, just need to have a big enough pot. I do just 2 ears for us and set a timer, takes about 10 to 15 minutes usually. Thank you for the tips! I will have to give that a try.